By now you're surely tired of reheating the same old side dishes every night, and like most families I'm betting you still have some leftover turkey. Here's a few of my favorite healthy ways to get creative with what's left in your fridge. You know what this week is for—Thanksgiving leftovers! By now you're surely tired of reheating the same old side dishes every night, and like most families, I'm betting you still have some leftover turkey. Here are a few of my favorite healthy ways to get creative with what's left in your fridge. So many of us just make typical Thanksgiving sandwiches (turkey, cranberry sauce, gravy) and don't even think that there are other ways to use post-holiday food for a week of delicious meals. Turkey is a great and healthy lean protein and is incredibly versatile. I rarely toss out anything—you can even use the carcass for delicious soul-satisfying soup! No need for any new ingredients to shop for this week—most of these are basics you probably already have on hand. 1. In a large pot, combine the turkey carcass, carrots, bay leaf, celery, garlic, and broth and bring to a boil. Reduce heat, cover, and simmer for an hour and a half, stirring and skimming occasionally. 2. Strain broth, reserving vegetables, then add turkey and veggies back in and heat through. Transfer hot soup carefully to a Vita-Mix or blender and process until smooth. 1. In a mixing bowl, combine all salad ingredients and toss well to coat. Let sit in fridge overnight or for a couple hours to let flavors set in. When ready to serve, toast bread and divide salad equally among sandwiches, stacking each with lettuce and tomato. 1. Preheat your oven to 400°. Sift together the flour, salt, and baking powder. Cut in butter and mix with your hands until the mixture resembles cornmeal. Add sweet potatoes and mix until just combined. Make a well in the center of the dough and add the milk, again just mixing until combined. Be very careful not to overmix! 2. Gently roll out dough and cut with biscuit cutters (or a floured glass bottom). Line up biscuits on a parchment-lined sheet tray and bake for 15 minutes, or until golden. 1. Heat oil over medium heat in a cast iron skillet. In a bowl, combine the leftover mashed potatoes and the beaten egg. Stir well so that the egg has been completely incorporated into the potatoes. Using floured hands, roll potatoes into golf-ball-size portions, and flatten and dip in flour. 2. 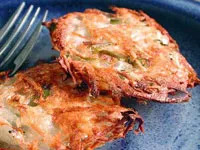 Cook each potato patty for about 4 minutes per side, or until golden and crispy. Drain on paper towels and serve drizzled with maple syrup, or alongside leftover turkey and cranberry sauce.